Go to the Articulate tab on the PowerPoint ribbon and click Publish. When the Publish window appears, select the Web tab on the left. Use the Description field to give learners a synopsis of your course. The description appears on information cards in the Articulate Mobile Player app. Use the Folder field to indicate where you want to publish your course—for example, your computer desktop. Click the ellipsis button (...) to browse to a location. Presenter will create a new folder in that spot with all the files needed to operate your course. Important: Always publish to your local hard drive. Publishing to a network drive or a USB drive can cause problems with your published output due to latency. After publishing to your local hard drive, upload the output to a web server for testing and deployment. If learners use mobile devices with the free Articulate Mobile Player app, you can display additional project information in the published course, such as the author, duration, and version number. Click the ellipsis button (...) next to the Title field to open the Project Info window. The Title and Description fields are the same as those on the Publish window (see the previous step). The image below the Title field will be the course thumbnail in the Articulate Mobile Player library. By default, Presenter uses an image of the first slide in your course, but you can choose a different image. Just click the hyperlinked text below the image, then select a different slide or click Picture from File to choose an image on your hard drive. Author, Email, Website, Duration, Date, and Version appear on the content information cards in the Articulate Mobile Player library. The Identifier applies only to content published for LMS. Keywords aren't currently used. They'll be used in a future version of the Articulate Mobile Player. When you're finished customizing the project information, click OK to return to the Publish window. In Presenter 360, you can choose which formats are included in your published output—HTML5, Flash, and/or Articulate Mobile Player. Click the Formats property on the Publish window to open this Publish Formats dialog. HTML5: This publishes your course as HTML5 output only. HTML5/Flash: This publishes your course as HTML5 first with Flash fallback. Learners will see HTML5 output if they’re using a supported HTML5 browser. If not, they’ll see Flash output. Flash/HTML5: This publishes your course as Flash first with HTML5 fallback. 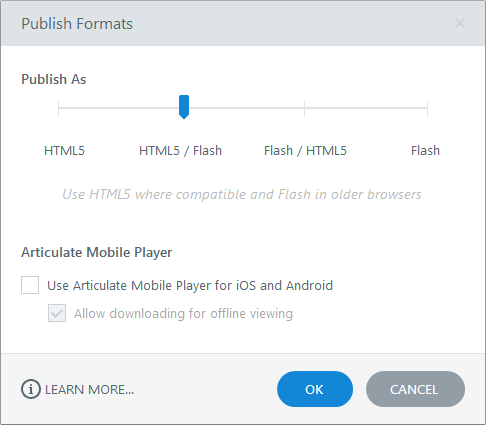 Learners will see Flash output if they’re using a Flash-enabled browser. If not, they’ll see HTML5 output. Flash: This publishes your course as Flash output only. While Presenter 360’s superior HTML5 output and new responsive player give learners the best viewing experience on tablets and smartphones, one unique benefit of the Articulate Mobile Player app is the option to view content offline. To let learners view your course offline, just mark the box to Allow downloading for offline viewing. After downloading a course to their Articulate Mobile Player, learners can view it at any time, with or without internet access, even if you remove the course from your web server. 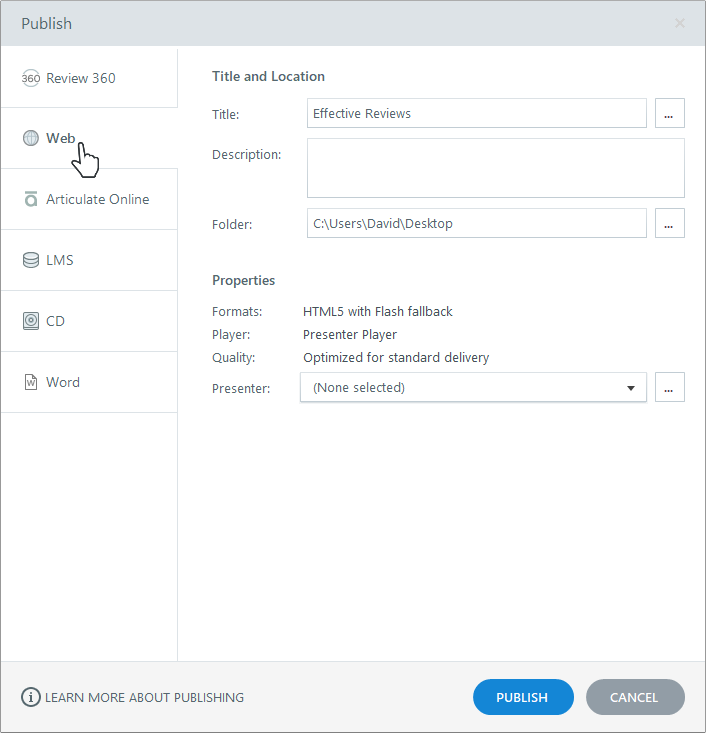 Use the Properties section of the Publish window to make last-minute changes to your player, adjust the quality settings, and assign a presenter bio to your course. The Player property shows the name of the player currently assigned to your project. (The player is the interface learners see around the perimeter of your slide content.) To make adjustments to your player, click the player name to open the player editor. The Quality property lets you control the compression settings for audio clips, videos, and pictures in your course. The quality settings default to whatever you used the last time you published a course. To change them, click Quality, make your adjustments, and click OK. Choose Standard if you want to use the default settings: optimal video quality of 5, audio bitrate of 56 kbps, and image quality of 80%. Choose Custom if you want to define your own quality settings. Drag the slider for any of the three values to change the compression. Higher values give you higher-quality output but also larger file sizes (which means longer download times). Lower values give you smaller file sizes and faster download times, but the visual and audio quality will be lower as well. Tip: Image compression only applies to JPG files. Mark the Optimize Audio Volume box to normalize audio throughout your course for consistent volume across content slides, interactions, and quizzes. Tip: If your course audio already has consistent volume, you can speed up the publishing process by unchecking this option. When you're finished making selections, click the Publish button. When the publishing process is complete, you’ll see the Publish Successful window with several follow-up options. This launches the published course in your default web browser. Important: Since your files have been prepared for web delivery, you might encounter unexpected behavior when viewing the course on your local hard drive. It’s best to upload your published output to a web server for proper testing. This opens a new email message with a zip file of your published course attached. This option is helpful if you need to send your course to a web server administrator for deployment. We don’t recommend emailing a published course to learners. Security restrictions on their computers will prevent some features in your course from working properly. Upload the course to a web server instead, then give learners a link to the presentation.html file. This opens a window where you can enter your FTP credentials and transfer your output to a web server. This creates a zip version of your course files in the same location where your course was published. This opens a file viewer where you can see the files Presenter just created. After you move the files to a web server, send learners a link to the presentation.html file, which is the file that launches your course. This launches the HTML5 version of your published course in your default web browser. Important: Since your files have been prepared for web delivery, you might encounter unexpected behavior when viewing the course on your local hard drive. It’s best to upload your published output to a web server for proper testing. Also, be sure to use a supported HTML5 browser. Now that you've published your course, it's time to upload it to a server and give it a test run. Then send learners a link to the presentation.html file. When learners launch the course, they'll see the right format (HTML5, Flash, or Articulate Mobile Player) based on the devices and browsers they’re using and the publish formats you included.